Production Solutions, Inc. is the manufacturer of the Vault Tooling line of Universal Part holders, End-Effectors and Grippers. 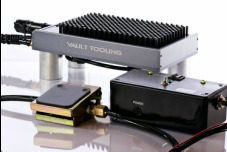 The Vault is an adaptive tool that can be used in multiple applications where the elimination of custom tooling, fixtures, molds or jigs is desired. The Vault utilizes a patented technology that uses a highly dense "bed of pins" that conforms to the shape of any part automatically. It then locks in place, creating a "nest" to hold the part during the desired process. After completion of the process, the Vault can be simply reset to prepare it for a new part. 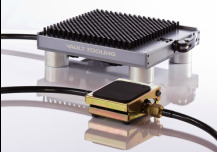 The Vault can be used on bench-tops and end-of-arm robots, or in factories and labs. This part holder eliminates the expense, time, and inventory management of custom molds, jigs and fixtures. Set up and changeover is done in seconds ensuring maximum uptime of equipment, and improved productivity and quality. 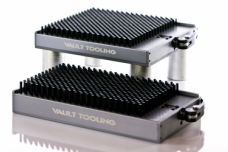 The Vault Tooling Part Holder is available in a variety of sizes and pin lengths, and can be configured for most applications and machines.